I hav been there at munnar along with my 13 frnz in search of peace,silence,calm n serenity n dis place is d best place to b. We went there on 25th evening at suryenili base camp from where they took us with a jeep to the camping sight which took around half n hour or so. 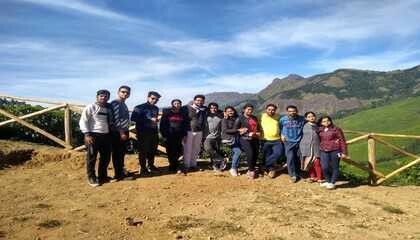 Bt that road was really challenging and thats d beauty of a trek.it ws n adventurous ride fr us. After dat we reach der at camp sight where we have 7 tents waiting fr us. It ws a full moon n d way d mountains were shining n d clouds were moving accross d mountains with a very vold breezy wind touching d face ws jusss amazing. The tents were comfortable. Der was a bone fire also where we spent more den 2 hrs, singing , dancing, playing games,. N above dem al relaxing in such silence n serenity. Nex morning it ws 5 o clock wen we hav 2 start our journey yo c d sunrise view from d top.. it ws my first trekking xperince so it ws a little hassled one..bt d sunrise view frm d mountain ws amazingly stunning. We hav been der fr 2 hr or so before coming down to camp sight. While coming back it ws a very panoramic view thru d tea estates. After having delicious brekfast whuch have 3 tyoes of fruits, grams,tea, bread slices, idli n all..it was really Delicious, After having brekfast v again started our journey to base camp..n in d mean while each n every sight r justs eye capturing. It ws really a nice experience.we r planning 2 visit again. Support staff r very nice.